I love all kinds of hot sauces, but sriracha sauce beats them all. What makes it so superior to other hot sauces unique is its smooth blend and perfect ratio of chilies, garlic, sugar and vinegar. I’ve been wanting to make my own homemade sriracha for a while, but never pursued it because it’s just so easy to buy a huge bottle of the stuff in Chinatown for three bucks … and why mess with perfection? However, when the kind folks over at Location 27 presented me with a pound of fresh, straight-from-the-garden habaneros last week, I took it as a sign to move forward with making my own sriracha*, even though the much-milder fresno is typically used to make the sauce. 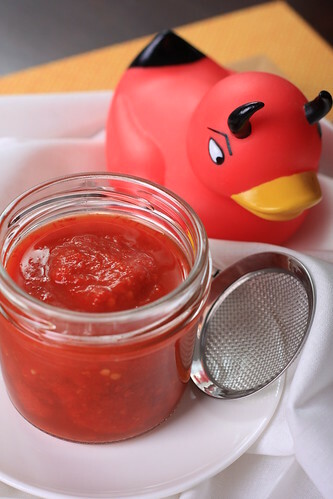 Due to its dramatically intense heat level, a habanero-based sriracha is best when used very modestly and will yield a seriously amazing and intense flavor without burning out your tastebuds. Adapted from Randy Clemens’ sriracha recipe. Put on a pair of plastic gloves and make sure your prep area is well-ventilated. Destem and half the chilis. Place in a blender with the garlic, sugar and salt. Puree until well-blended. Using a spatula, scape the contents into a glass container and cover. Store it at room temperature, stirring it once a day for seven days. This will allow the flavors to blend and slightly mellow. After a week, pour the puree with the vinegar into a small pot over medium heat. Bring it to a boil and let it simmer for about five minutes. Transfer the contents to a blender and puree again for two minutes. Strain the puree through a fine-mesh strainer, retaining a bit of the pulp in the end if you’d like. Keep it stored in the refrigerator. *Habaneros are seriously hot and the fumes alone can cause coughing, sneezing and skin irritation. Wear plastic cloves when handling them and always work in a well-ventilated area during prep. Cool! If I ever come over a pound of habaneros I might try it. I really like sriracha. Homemade sriracha?! Oh man, what a great post to see first thing in the morning. Also, I am impressed by your ability to look a pound of habaneros in the eye and make something awesome out of them. for serious?!?!?! awesomesauce, Erin!!! dan's going to flip out! MEGAyay! I've never tried sriracha because I stick with tapatio but I am interested in making my own, especially once my plants products habaneros! I can't believe you made it yourself! Sriracha is such a staple of my diet, it never occurred to me I could make it myself. Looks great! That looks stunning. And also full of chillies, which I approve of. ooooooooooooh. this is amazing, and i totally wanna try it… but maybe with milder peppers. Thanks jessy! This stuff is CRAZY hot — I mix about 1/2 tsp into 1/4 cup of vegenaise and it's PLENTY hot. But yummy! wow.. i couldnt finish my big bottle of sriracha that i bought like id ont know how many years back.. but i just threw it out!! i need to try this pronto! awesome looking sriracha! My mouth is seriously watering! !